These are letters that I found in the Schlesinger Library at Harvard University, written to a Boston lady named Fanny Quincy Howe. 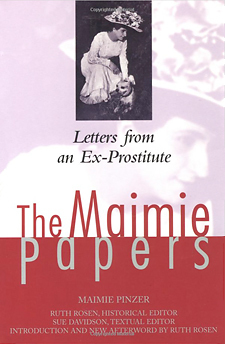 Maimie Pinzer was the daughter of an immigrant family from Poland/Russia and after becoming a prostitute, wrote 1,000 letters to Mrs. Howe, the wife of the well-known historian Mark Howe. In these letters, she described her efforts to leave "the life," and eventually with the help of her patron, she created a shelter for "ruined girls" and after the 1919 flu epidemic, married and adopted two of her brother's children. These letters have been annotated and edited to 500 pages. Historical Editor: Ruth Rosen; Textual Editor: Sue Davidson; with an Introduction and New Afterward by Ruth Rosen. Original published by the Feminist Press in cooperation with the Schlesinger Library of Harvard University, December, 1978. * New York Times Notable Book *in l978. Reprinted with a new afterward, "Searching For Maimie," March l996.